"Skagit County town's history is rich in Concrete"
Many of Puget Sound's projects can trace their roots to the state's first cement plant in the town of Concrete. "Is your mine ready for an extreme makeover?" SCommunity acceptance of the aggregate industry is the key to easier permitting of new mines and maintenance of existing ones. 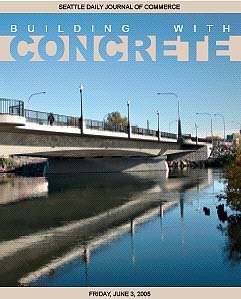 "Special concrete weighs in locally"
Northwest contractors find self-consolidating concrete dramatically reduces time and labor on commercial projects. "Pump up your concrete strength with slag"
Looking for a way to improve the quality of concrete, increase strengths, enhance workability, upgrade pumpability, and make a sustainable product even greener? Think slag.